As 2018 comes to a close, experts share their thoughts on the lithium outlook and what key factors to watch next year. Announcements of new electric vehicle (EV) models from carmakers continued to rapidly increase in 2018, with lithium-ion megafactory capacity expected to reach over 1 terawatt hour, according to Benchmark Mineral Intelligence. But even though the outlook for demand is getting stronger by the day, lithium sentiment from some investors was bearish throughout 2018, with lithium stocks performing worse than many had expected heading into the year. With the start of 2019 just around the corner, many investors are now wondering what will happen to lithium next year. 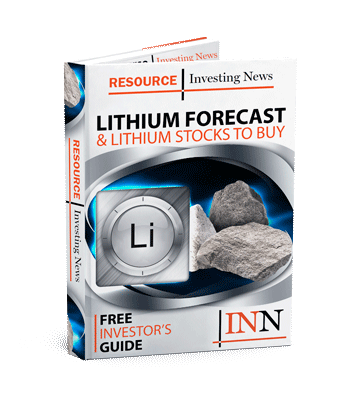 Here the Investing News Network looks at lithium’s 2018 price performance, what analysts had to say about the market and what’s ahead for the metal in 2019. As the year comes to a close, most market watchers would agree that at the start of 2018 oversupply concerns were the main talking point in the lithium sector. For battery metals expert Chris Berry, the bearish report released by Morgan Stanley (NYSE:MS) early in 2018 set the tone for the rest of the year. “In my opinion, despite the flaws in the logic in the report, it really set the tone for lithium investing in 2018, and quite frankly it scared a lot of speculative capital away,” he said. For Benchmark Mineral Intelligence Senior Analyst Andrew Miller, what’s actually played out in terms of supply this year has been incremental new volumes reaching the market and not a “tsunami of supply” like some had predicted. “I think that really speaks to what we’ve been saying for a long time, which is how difficult it is to bring new supply into a market like lithium,” he added. “When you think about the overall size of the market, and how most of the business that’s done in the lithium space is done on a contract basis, my sense is that the focus on the China price is really over, overdone,” he added. Lithium expert Joe Lowry of Global Lithium agreed, saying that one small parameter of lithium prices is what goes on in China in the spot market. “But the important thing is that pricing is very firm. Pricing is actually still much higher than what I say should be the new normal, based on the cost curve,” he added. Similarly, Benchmark’s Miller said this year investors were trying to understand how China’s price could impact the market. “The volatility in China is quite isolated from what’s happening to pricing in the rest of the world,” he commented. Meanwhile, Fastmarkets Head of Research William Adams said prices have fallen more than was generally expected at the start of the year. “The subsidy changes in China did disrupt demand as it led to destocking, and changes to production lines also affect workflow and demand,” he explained. Speaking about his expectations for 2018 at the end of last year, Benchmark’s Miller said they were pretty much in line with what happened. Looking over to demand, Roskill Division Manager David Merriman said greater-than-expected sales of EV models, particularly in China, have been fueled by the progressive phase out of incentives, while the use of more powerful and larger battery cells in EV models to improve range and performance has increased lithium’s intensity of use per vehicle. In fact, the idea that the lithium demand narrative is getting stronger by the day seems to be a trend most analysts agree on. “I think the consensus on demand is the surprise, the positive surprise is on the demand side,” Lowry said. The other noticeable trend for Adams was the rapid ramp up in DSO (direct-ship ore) and spodumene supply from new hard-rock producers in Australia. “Over the course of 2018, Tawana Resources (JSE:TAW), Pilbara Minerals (ASX:PLS), Altura Mining (ASX:AJM), Mibra and North American Lithium have entered the supply chain. Having five new entrants in one year in a small market makes a splash,” he added. In 2018, Roskill’s Merriman said major lithium producers have undergone a shift in focus away from expansions at brine-based operations in South America to lithium mineral production and processing, as they look to join a surge of new production in Western Australia and develop lithium-processing capacity outside of China. Looking at the biggest news in the sector, Adams said it has been the disjoint between the 50-percent price fall and the strong EV demand. “Those saying lithium is not a commodity but a chemical were leading the market into a false sense of security about prices being able to withstand the supply response that was getting underway,” he said. Another disconnect the market has seen this year is between the optimistic demand outlook and the stock market. “I’ve never seen a bigger disconnect than I have currently seen right now in the lithium market just with respect to the demand side of this equation,” said Berry, adding that he hasn’t seen any data or any evidence that the demand narrative is slowing down or reversing. “My sense right now is that when we look back at 2018, it’ll be a year where valuations reset because there are some enormously cheap opportunities in the space right now based on all of the blood that’s been on the streets,” Berry added. As the new year begins, many lithium-focused investors are wondering what’s ahead for lithium supply and demand dynamics. For Benchmark Mineral Intelligence, the lithium-ion battery industry is planning for a huge NCM (nickel–cobalt–manganese) cathode ramp up. In fact, the shift towards lithium hydroxide-intensive cathodes is underway, with the London-based firm expecting that about 44 percent of megafactory cathodes will need it as a raw material by 2028 — which translates to approximately 534,000 tonnes. “We have seen a shift towards 622 and 811 NCM technology happen to some extent this year; there’s a lot more development that’s needed in the cathode technology,” Miller said. “But how quickly those cathode producers are able to move to this high-nickel cathode chemistry will dictate the type of chemical that is needed, whether hydroxide or carbonate, and more interestingly what type of supply chain may be more economical,” he added. Meanwhile, Roskill is of the view that the shift to higher-nickel cathode materials will incentivize lithium hydroxide production over lithium carbonate production at many plants. The firm forecasts lithium demand to grow by in excess of 21 percent per year between 2018 and 2025, with demand expected to increase by 13.5 percent in 2019. In terms of the project types he sees growing next year, Adams said the speed at which hard rock has come online has surprised the market, but there are now likely to be fewer new startups for awhile — although this year’s startups are expected to continue to ramp up spodumene output. “The fact that there have been joint ventures between brine producers and hard-rock producers and vice versa suggests the big producers are also keen to have a foot in each camp,” he added. Adams also forecasts that oversupply will weigh on prices further in 2019, but sees demand continuing to grow at an accelerating pace. Fastmarkets expects EV penetration of about 15 percent by 2025, from 2 percent penetration in 2018. Meanwhile, for Lowry, the real hockey stick in the demand curve isn’t going to happen in 2019. Benchmark’s Miller agreed, saying 2019 is going to be an interesting transition year for the industry, but real demand growth will not happen until around 2020/2021. “I say transition year because I think there’s still a lot for the industry to overcome in terms of bringing new supply and establishing that supply chain from feedstock through to a chemical used by the battery industry, and there’s also a lot of pressure on the companies downstream to start involving themselves with the supply chain a little bit more closely,” Miller explained. For Roskill’s Merriman, there are several problems that need to be tackled by various areas of the industry, whether it’s brine processing at operations in the Americas, securing offtake agreements for mineral concentrate producers or restrictions on water usage in the Atacama. “One common issue that continues to restrict the lithium industry and its ability to meet the forecast demand requirements is the availability of finance for development of new projects and expansions,” Merriman said. He added that in the short term, the supply/demand balance will remain close to equilibrium for battery-grade products, though beyond 2021 he agreed that the market will move into significant deficit if further capacity is not financed, constructed and commissioned on schedule. Speaking about financing, Benchmark’s Miller said there’s still a huge amount of investment needed in the industry. “I think that really remains a significant challenge to a lot of the development-stage companies coming into the market, and you have various figures [saying] in and around US$8 billion is going to be needed by 2025/2026 to meet demand,” he added. For his part, Lowry said he expects that largely the lithium industry will continue to finance expansion. “Existing players will lead the expansions, they will lead the development or acquire juniors, or interest in juniors,” he added. Looking over to how prices might perform next year, Fastmarkets remains bearish, saying the market will have to absorb new supply that has come online in 2018 and that will ramp up in 2019. Meanwhile, Roskill’s Merriman said Chinese internal lithium carbonate spot prices look stable as 2019 approaches. Contract prices also seem to have hit a peak, with a stable to slight decline predicted for 2019 as some higher-priced contracts have been linked to the spot price. For Benchmark’s Miller, there’s not going to be much more decrease in carbonate prices, but the market could see a softening of hydroxide prices in the first half of the year as they have been much more resilient throughout 2018. “What investors need to be looking out for is definitely moving away from just using China as a growing global price trend,” he added. In terms of supply in 2019, Merriman said further acquisitions by major lithium companies and investments in lithium projects under development are likely, while on the demand side, EV legislation in China, the US and Europe and any reported changes in cathode chemistry for major EV manufacturers will be the areas to watch.